LAWRENCE — In February 1805, during their Corps of Discovery Expedition, Meriwether Lewis and William Clark encountered a purplish daisy prized by tribes of Native Americans across the Great Plains as a “cure-all.” Learning the plant was used to treat bites from “mad Dogs [and] Snakes,” the explorers sent a specimen off to Thomas Jefferson, president of the United States and part-time botanist. Today, we know that same plant as Echinacea, one of the most popular medicinal plants in the U.S. and Europe due to its ability to fight colds and flu and boost the human immune system. A recently published book co-authored and edited by Kelly Kindscher, senior scientist at the Kansas Biological Survey and professor of environmental studies at the University of Kansas, explores "everything known" about the purple coneflower. Written for both popular and academic readers, “Echinacea — Herbal Medicine with a Wild History” (Springer) explores the botanical’s natural history and how it’s been grown, conserved and used. According to the KU researcher, Echinacea is still underappreciated in the U.S. Kindscher points out the immune-boosting plant was shown in a recent European clinical trial to be as effective and safer than the prescription medicine Tamiflu. The KU researcher lamented that U.S. medical professionals are unlikely to recommend Echinacea or other time-tested botanical health products to patients, instead opting for pharmaceuticals that often can cost more and hold higher risk of side-effects. But most doctors don’t learn about herbal product in medical school. Beyond advocating for Echinacea in human health, Kindscher’s new book on the purple coneflower reflects a career spent studying a genus that is native to Kansas. Indeed, the KU researcher said most wild-harvested Echinacea root used for medicine historically grows in western Kansas, especially in “post-rock country” north of Hays. 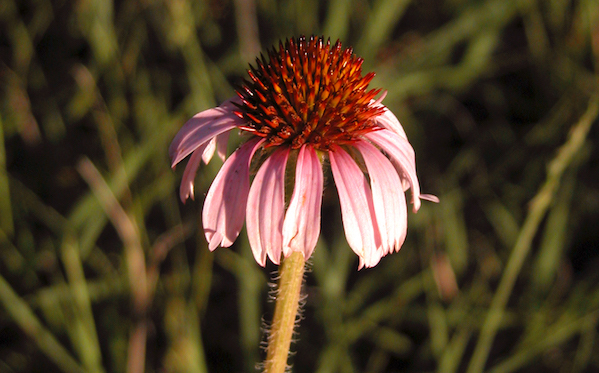 He said there was cause for worry about the health of Echinacea populations in the state and across the Great Plains. Kindscher’s co-authors on the new book include KU colleagues and several of his former graduate students from KU, inducing Rebecca Wittenberg, Dana Price, Rachel Craft, Congmei Cao and Dr. Jeanne Drisko, director of the KU Integrative Medicine program at the University of Kansas Medical Center.